It’s Perfect Picture Book Friday/Susanna Leonard Hill Week on By Word of Beth! On November 14, 2011, author Susanna Leonard Hill’s blog featured a post that piqued my interest (to say the least). Reviewing picture books every week? Sharing resources to help families, classes and libraries more fully utilize those picture books? I didn’t have to think for long. I was in. We have a delightful logo, thanks to Loni Edwards (see above left) and now, thanks to Alison Kipnis Hertz, we have a bookmark featuring the logo, information about PPBF AND a QR code so that people can scan it and be taken directly to the PPB page on Susanna’s blog. As these bookmarks are distributed here, there, and everywhere, I know that our purpose of sharing resources with parents, teachers and librarians will really take flight. A side benefit to all the reading and reviewing has been the community that has grown up through our weekly meeting over picture book reviews on our blogs. We have become friends as well as colleagues, and many of us support each others’ blogs the rest of the week as well. Writers, illustrators, teachers, librarians, readers of all sorts draw together in a cyber-meeting weekly, and we have a lot of fun together, as well as sharing great books and great ideas. I am truly grateful for Perfect Picture Book Fridays, and so, as PPBF marks its first year, I will be celebrating all week long. I hope you’ll come back on Wednesday, when I’ll be interviewing author Susanna Leonard Hill, the originator of Perfect Picture Book Fridays. On Friday, I’ll be adding another of Susanna’s books to our list. 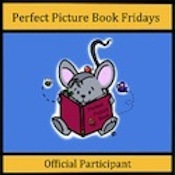 If you are a participant in, or a reader of, Perfect Picture Book Fridays, what has PPBF meant for you over the past year? Meeting new people. Definitely. PPBF has let me meet new bloggers. I have done it just about every week since I found out about it (I think). It is a great place to find good books too! Thanks, Erik! Meeting new people is definitely one of the best parts of PPBF for me, as well. And seeing the great books they share — it’s fun to look at the list each week and try to guess who posted which book! You’ll enjoy the interview, I know! You’re welcome, Susanna! You and PPBF are certainly worth celebrating! Here’s to PPBF success and spread! Great to know that you are doing an interview Wednesday with Susanna. She had a great vision that has proven to be very successful. We all love PPBF! It is a place to showcase some of the best picture books for kids. And, for those of us who participate, we have become a community. Great comments on behalf of all of us! Thanks, Pat. Susanna is a visionary, for sure. Look at all the wonderful initiatives she has spearheaded! A rousing chorus of “And so say all of us” just started up in my head!